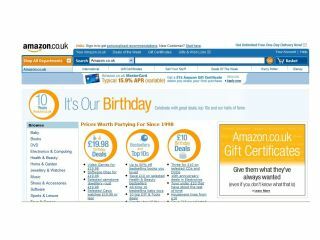 The UK leg of Amazon's website celebrates its 10-year birthday today. Although the American side of the company started back in 1994, when founder Jeff Bezos launched the site as an online book-seller, the UK version took another four years to go live. Since then, the company has grown from small-time bookseller to big-time electronics retailer, taking a dip into musical waters with the launch of its music store and looking to the future of reading with its (US only) Kindle. 1 The UK software development plant for the company is based in Ricky Gervais' favourite town, Slough. 2 In 2008, the website has been clocked at attracting 615 million visitors annually. 3 IMDB the online movie Bible is owned by Amazon. 4 Amazon's logo has an arrow pointing to the A and the Z. This is meant to represent that the site sells a lot of products. 5 Amazon has branched out into film production and will be releasing its first film The Stolen Child in conjunction with 20th Century Fox. 6 Amazon's 10th anniversary in the US was celebrated with a sing-song from Bob Dylan and Norah Jones. 7 Amazon paid £1,950,000 for a hand-written copy of The Tales Of Beedle The Bard. The Author? JK Rowling. 8 Amazon's original name was Cadabra.com. 9 Amazon has its own product line, titled Pinzon. 10 In 1999 Amazon founder Jeff Bezos was named Person Of The Year by Time magazine. To read more about Amazon, just check out our 20 Websites That Changed The World feature.